About a month ago, we wrote about a robot that a Microsoft employee built to keep his pet company during the day. 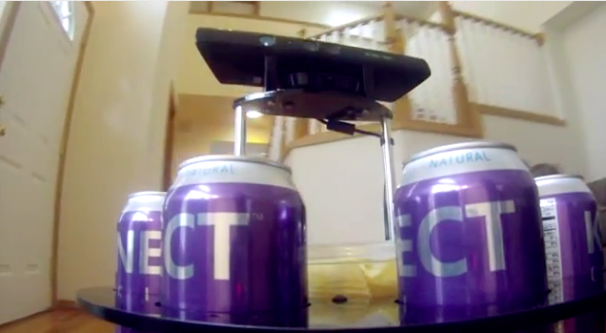 Its creator, Microsoft Robotics test developer Jordan Correa, used a Kinect to serve as the robot's "eyes," and programmed it with Microsoft Robotics Developer Tool 4. And now, you too can use the same development software for your next robotics project. As announced on the Microsoft Robotics Blog, the final release of Robotics Developer Studio 4 (RDS 4) is now available as a free download. Microsoft released a beta version of the toolkit back in September, and it's been hard at work on finalizing the software since then. The official version of RDS 4 is compatible with the "RTM" (final) version of the Kinect for Windows SDK, which should make it easier for hobbyists, researchers, and so on to integrate the Kinect into their robots. Microsoft also published a video that gives some examples of what this technology is capable of. Some of the examples given in the video are mainly proofs-of-concepts--like the robot that will follow you around--and aren't terribly practical. That said, it isn't difficult to see how this new software could be put to good use in more practical ways. Take, for example, this Kinect-powered robot that can help find earthquake victims stuck under rubble: If this is what people could do without official developer tools from Microsoft, we look forward to seeing what'll be possible with RDS 4. What robotic Kinect creations would you like to see? Share your thoughts in the comments. And if you have a robot of a Kinect hack that you'd like to show off, feel free to drop us a line.